Maybe I should go to the gym. Perhaps if I got a personal trainer, I could lose the 20 pounds I gained over the past 2 years. I could fast for a few days or try that juice-cleanse everyone is talking about. That might do the trick. Fine, I’ll go to the gym and run on the treadmill, even though I would rather be on the couch. Never mind, I’m going to stay on the couch, eat a bag of potato chips, and watch The Biggest Loser. How many times has this script (or something similar) run through your head? For three years in college, these thoughts ebbed and flowed in my head every day from dawn until dusk. I wanted more than anything to lose weight, but I kept making excuses. School was too time consuming, the couch was more comfortable than going to the gym, and take-out food was more convenient than preparing meals. Not only did I make these excuses everyday, but I woke up every morning ashamed to look in the mirror and told myself I was not worthy of being healthy. In my last semester of college, I enrolled in a life changing motivational psychology course. The lessons I learned in this course taught me not only how to get motivated, but also how to stay motivated. I will share four invaluable skills to increase your motivation and how I applied each skill to lose weight and become healthy. Specific: I wanted to lose 35 pounds within 4 months of graduating college. Measurable: I will weigh myself every 2 weeks and strive to lose 1-2 pounds per week. Attainable: This goal was realistic and achievable given my circumstances. Relevant: I was overweight and wanted to feel better when I looked in the mirror. Timely: Given 6 months, I was capable of losing 20-30 pounds. I will go to the gym four days a week, for 30 minutes each day. I will consume no more than 1600 calories a day. I will eat breakfast every morning and stop eating after 7 pm. Every cell in my body radiates with energy and enthusiasm. I deserve to have affluence and prosperity in my life. According to Psychology Today, positive affirmations may increase desired behaviors when they are a part of a “comprehensive program of self-growth.” Affirmations can be used for more than personal development. They may also be used in business or achieving financial goals. If you struggle to write your own positive affirmations, the web is a great resource to discover affirmations. Make sure you have your affirmations written in a journal so you can refer to them on a daily basis. 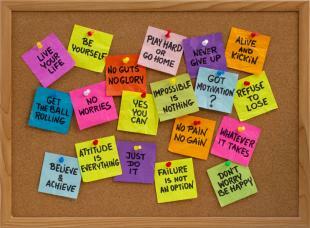 Just like positive affirmations, vision boards provide visual stimuli that show the goals you want to achieve. Create your vision board with a collection of photos, graphics, words, and quotes that represent your goals in a visual presentation. Make a collage from magazine cutouts, post a personalized board on Pinterest, or get crafty and draw your vision from scratch. Here is an example of a vision board I created for 2013. I recommend you create vision boards on a yearly basis, or for each goal you wish to achieve. Businesses may want to create vision boards for each quarter. Make sure your vision board is located in a place you look daily such as your refrigerator, computer desktop, or your company break room. When you surround yourself with other positive, motivated people, they are most likely to provide support and encouragement. Gather a small, quality network of family, friends, and colleagues who will support your goals and hold you accountable for the choices you make. If anyone tries to discourage you, ignore their negativity. Constructive criticism is necessary for changing behavior, but discouragement will not help you stay motivated. If you do not have access to a strong support system, reach out to like-minded people who share similar interests and goals. Online communities such as Quora and Linkedin offer online communities to discuss personal and professional development topics. Local community centers are also a great place to meet other people interested in health, fitness, sports, and special interest groups. Now that you are motivated, stay motivated! These four tips are a foundation for getting and staying motivated. It is critical to implement these tips daily, and examine your goals on a regular basis. If you continue to see the glass half-empty, consider taking “S.M.A.R.T. Goals” by ej4, “Goal-Setting in the Workplace” by Syntrio, or reading a self-help book. One of my favorite self help books is called “I Think I Smell Garlic” by J.C. Melvin. Above all, always maintain a positive attitude and know you have the capacity to achieve any goal you set your mind to. How do you stay motivated? We would love to hear in the comments below.